In a talk titled Reinventing IT, Prof Clay Christenson, author of The Innovators Dilemma, asks a simple question: Why do so many big businesses fail? He analyses about the steel industry, the car industry, and more recently the poisonously profitable partnership between Dell & ASUSTeK, and notes how all these industries were eventually disrupted by what appears obvious in hindsight. I began wondering what other examples will join his list. Reading about what really happened with the Microsoft Courier, I realised that Microsoft (or certain divisions of Microsoft) are well on their way to providing yet another example of where big businesses fail due to safe decisions. It reminds me of the old start-up adage, if you think being risky is scary, try playing it safe. Most assume that that Courier never made it beyond “cool promo video” stage, but that isn’t the case according to all involved. The Courier was rejected because it would have dragged the company, kicking and screaming, in a new direction. A direction that didn’t necessarily involve Windows. Steve Ballmer is notorious for lines such as “If you cut me open and saw what was inside, it’s Windows Windows Windows“. This might be good for motivating the Windows team internally, but it blinds the company to the potential of market disruption, to the idea that there is to more technology than Windows. The Courier was canned, in favour of the Windows tablets which take inspiration from the Metro UI used in Windows Phone 7. These tablets runs Windows with a new metro UI layer on top, but, much like Ballmer, when you cut it open you’ll see the same old Windows inside. This is exactly what Prof. Christenson would refer to as a sustaining innovation, and is what is depicted in the top graph. An attempt to keep leading a market, by maintaining their current course. At this point Windows does everything Windows users want it to do. Microsoft has spent years adding unwanted features, oblivious to the fact that features aren’t the problem. Windows is. 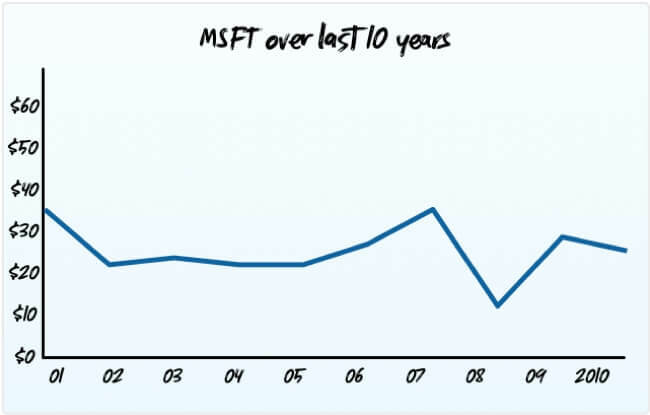 Microsoft’s persistence with sustaining innovations is reflected well in their share price. Not a bump in 15 years. In their fiscal year ending 2010, they had their most profitable quarter in the companies history. They saw Windows 7 become the most successful piece of software ever released, selling over 300 million copies in 15 months. The effect on the share price? Negligible. In the past 5 years they’ve gone from $28.34 to $27.16. In the past 10 years, they’ve done little more. Why is that? Clay Christenson in a different talk, does an excellent job of explaining how a share price is constructed. Despite the billions of dollars of profits, Microsoft’s share price hasn’t moved. This is because they are precisely predictable. Their shareholders have gotten exactly what they paid for, and not a penny more. The market doesn’t reward you for growing by a figure that was expected. That return was already built into the share price. The market punishes you for falling short of expectations. Even Apple got a taste of that recently when they fell short of analysts expectations. Apple’s share price is composed of two parts, and both are in good shape. One chunk of the value is predicated on the expected successful future growth of the company as it exists today. This part equates to the future growth of all Apple products that we know about. And it’s doing really well. The other chunk of Apple’s share price rewards their unpredictability. That is, the likelihood that Ive & Cook will stand up next year at WWDC with new products targeting new growth. Apple Television’s, iPad 3, iPhone 5, iCars, whatever. You don’t know. I don’t know. No one knows. That’s the point. They don’t do concept videos, they don’t talk about future projects, they rarely give interviews of any sort. No one knows where it’s going, but everyones betting that it’ll be good. The risk here for Apple stock comes when that expectancy runs wild or rather, wilder, at which point the shares should begin to level out. What’s really important here is that Apple are willing to disrupt their own products as part of this. They replace themselves in the market. The iPhone has effectively replaced the iPod. A combination of iPad and Macbook Air will see the end of Macbook and eventually Macbook Pro. There is already talk about the end of Mac Pros. As Gruber noted, You don’t need a weatherman to know which way the wind blows. A key difference here is that while Microsoft are obsessed with protecting their core products, Apple are obsessed with replacing them with something better. Hence Microsoft is struggling to shoehorn Windows into everything, while Apple wasn’t afraid to work on iOS. There is rarely such a great example of sustenance vs disruption in the market, and the share prices show you which one works better. The questions is will Apple continue to surprise us? Can they continue to disrupt markets beyond what they’ve done already? My guess is yes. For a while.